MACKENZIE Bond says it’s the era of the farmer’s daughter in the Australian agriculture industry – and she has the passion to prove it. 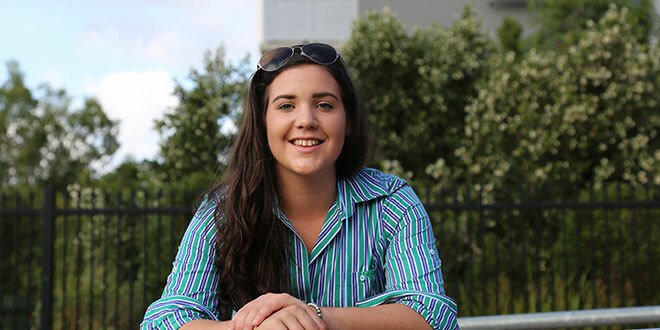 Ms Bond, 2017 alumni of Mt Maria College, Mitchelton, recently returned to the college for an International Women’s Day event on March 8, when she spoke about her journey in agriculture and life. Ms Bond came from a rural background and said she was proud of her deep roots. “From where I’m coming from, women in agriculture, it’s a huge demographic now and it’s growing exponentially,” she said. “I was at an AgTech conference, EvokeAg, in Melbourne last week, and it’s the era of the farmer’s daughter. “We are coming up through the ranks and we’ve got new ideas. Ms Bond recently travelled to India, where she said she was “really confronted by the cultural differences there”. She said, as Australians, we are so lucky. “I really took for granted that I’m an 18-year-old assistant manager who, you know, speaks to and goes toe-to-toe with middle-aged men who are high in their field on a daily basis,” she said. Farmer’s daughter: Mackenzie Bond says things are looking positive for the future of women’s participation in agriculture. As for coming back to her college, Ms Bond said she was proud about what the students and staff were achieving. “It’s great to come back and see where I came from and where it all began is still very much intact,” she said. 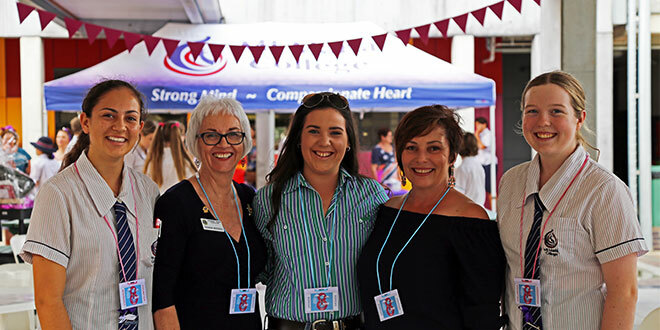 The IWD event at Mt Maria College celebrated the role women played in society and highlighted some of the struggles facing women. Mt Maria social justice captains Zara Grlj and Lily Moffat organised the event. College principal Glenn McConville said Zara and Lily took the initiative and approached the Queensland Government for a grant and were fortunate enough to receive one. “Through their hard work and great ideas, they were able to put on this afternoon for recognition of International Women’s Day in our community,” Mr McConville said. Zara said IWD was to “really open up women’s minds about how women are struggling, about how all these different women are empowering other women to get back on their feet and help them”. Her message to the younger students was not to be scared and to step out of their comfort zones. “Go be you,” she said. Lily agreed, saying it was a day to connect especially with the younger students to lead them and show them what can be achieved. Mr McConville said the college had been involved with many discussions throughout the past couple of weeks about the importance of recognising women’s rights and the equality of women in society. This connected with the college’s Marian identity. “We talk to the staff and to the students about how important (the Marian identity) is and showing that humbleness and that sincerity, that care for each other – and trying to emulate those characteristics from Mary in our daily life,” Mr McConville said. Guest speaker Michelle House said IWD was for everyone to celebrate women and honour the women who came before them, “because without them and their self-belief, we wouldn’t be here today”. Mrs House said she was seeing a lot of specific foundations and charities to help women in many areas in their lives from poverty to domestic violence. “So, I would say to women out there that are in any kind of crisis, that help is available, and the hardest thing to do is ask for help,” she said. Within the Brisbane archdiocese, the special contribution of women was acknowledged with a morning tea at the Catholic Women’s League’s Cathedral Coffee Lounge. The gathering brought a mix of workers, women and men, from across the St Stephen’s Cathedral precinct. Archbishop Mark Coleridge stopped by the coffee lounge to offer his vote of thanks to the women of the archdiocese too. Archbishop Coleridge’s brief remarks acknowledged the archdiocese’s women for their work and the struggles some women faced. He also reminded everyone that Australia was a lucky country and, for many places around the world, the situation for women was desperate.